Now you can shop online right from the Have Fun Teaching web site! I included all of the best workbooks for teachers, high quality flash cards, educational board games, and coloring pages. If you shop at the Have Fun Teaching store, you can SAVE money and most of the time you can get free shipping! 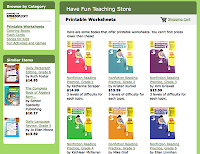 Check out the new Have Fun Teaching Online Store and get great stuff for your classroom.